Let’s go back to 1 July 2014. At this day, we chit chatted about the Fall Winter 2014 Collection and accidentally ended up gossiping about the new round-shaped shoulder bag that Chloe was about to release. Though at that time, I didn’t know its name, shape and prices, because the bag wasn’t available in store yet (and Chloe didn’t wanted to share their secrets), but oh well, today we got all the info’s for ya! I remember the model that was wearing this bag, she had a dark blue jacket and beautiful green boots (click here if you are curious about the picture), then she finished it with the newest Chloe Drew Shoulder Bag. Gorgeous! First, I like the design; it’s something that you can’t find somewhere else. Secondly, you can easily wear it with formal or casual clothes, it fits in both worlds – anything multifunctional is worth the investment. I love how the golden hardware dominates the design – expressing its reason for existence, which is endless luxury. Crafted with calf leather, a strong and durable material, it’s certainly a one-time investment, and it’s forever yours. Are you up for something embellished and beautiful? We’ve got just the bag for you – presenting, the Chloe Drew Bag with Heart, Spade, Club and Diamond Embellishments! We just love how the brand has managed to revamp a classic design, giving it a wonderful spin that we are totally in love with. Bravo, Chloe! As we all know, the Chloe Drew is a classic favorite among bag lovers – whatever the taste and preference, a lot of aficionados tend to share common denominator, and the Chloe Drew is but among the few pieces in the industry which caters to seemingly opposite styles. This is such a wonderful surprise for us because aside from its luxe material, shining piston closure and wonderful, rounded shape, it now has more of the fancy bling in front. Every time you wear this baby, it feels like you earned yourself a “Royal Flush”. Well, bet on it! For now, we don’t have info about the bag’s price and availability. Just stay tuned for more updates about this bag (and other pieces) soon! I adore designs that are minimalistic but with a twist. Simple yet impressive, basic but timeless. For example, the Chloe Mini Crystal Flower Drew Bag – completely covered with durable leather, made with a shape that can last for decades and refined with crystal that every woman loves. There is no need to introduce the Drew Bag, it’s Chloe’s latest design and determined to pave its way to the iconic status. 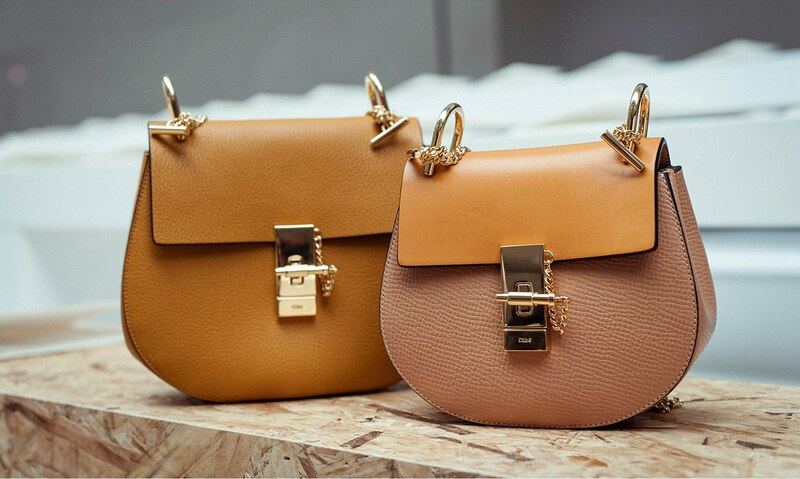 Just like its bigger sisters; the Chloe Marcie and Paraty Bag. The Chloe Drew Bag has a curvy shape, which is perfect for the modern woman. Then if you look further, you can find the other unique elements like the beautiful chain. But what’s most intriguing is the new decoration for this season. Ladies, it’s limited available – the gorgeous jewelry and crystal are embellished on the exterior of the bag. So they look like luxurious flowers and the upcoming summer season is the best time to wear it, don’t you think? The Chloe Drew Bag has become somewhat of an icon over the past couple of seasons and now come Autumn 2015, it’s one of the most popular bags on the fashion scene. The Drew bag from Chloe is a fashion blog must have and it’s the perfect, feminine purse to have on hand at all times. Not only is the golden chain and hardware detailing just elegant and classy, but the Drew comes in various sizes, ranging from the Nano, Mini and Small to the classic, Medium and Large styles, so there’s a Chloe Drew bag for absolutely everyone, no matter your preference or occasion. I’m sure that you have worked out by now just how many colours and combinations the Drew comes in, but if you weren’t sure, Chloe released it in pastel tones of blush, grey, taupe, white and more to bright pops of red, black, blue, yellow, orange and even double colours, giving it a bi-colour theme! There’s some brand new variations for Fall right now too, including Autumnal tones which even mix in exotic prints. What do you think of the way these fashion bloggers styled their Chloe Drew bags? You can shop your own Chloe Drew bag online atHarrods, Matches, Selfridges and Net-A-Porter. I know I have had my eye on the Mini Grey version for a while now! For seasons on end, Chloe has been giving us their best when it comes to bag design…and their Fall 2015 offering is no different! Some Drew bags are up for grabs, so you better hang on and get pumped for this! That’s the end, ladies! Get your very own Chloe Drew Bag now!